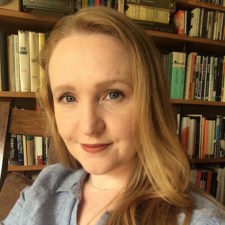 News Voices has been centering the voices of local community members in conversations about journalism’s future that have gone on mostly among journalists and academics. Since we launched in 2015, first in New Jersey and then a year ago in North Carolina, we’ve hosted dozens of public forums, workshops and meetups where we’ve listened to people tell us the importance of local news – how it’s failed them, how it’s helped them, and what they want to see. As community organizers and former reporters advocating for informed communities, we bridge divides newsrooms have not. We use dialogic processes to engage cross-cultural conversations. We urge journalists to think of those they serve not just as an audience, but as a constituency. And we’re mobilizing that constituency: In NJ, to shape and support a Civic Info Bill to use spectrum auction proceeds to fund local news. In NC, we asked organizers, artists, librarians, students and journos what news Charlotte needs to address economic inequality with ground-up rather than top-down solutions. We’ll tackle misinformation in Rocky Mount by mapping information assets in a place many consider a news desert. Communities, not newsrooms, are leading the way. Panel colleagues L to R: Frank LoMonte (the Brechner Center), Fiona Morgan, Sharon Jarvis (University of Texas), Zack Mezera (Providence Student Union), Anushka Shah (MIT Media Lab). Creating a Culture of Listening: Using Dialogue to Bridge Divides gathered community-minded journalists, editors and nonprofit leaders who are pioneers of listening and dialogue projects in journalism. The event brought together people with a range of titles, all of whom have hands-on experience or big ideas on the ways journalists can better understand and serve the whole of their communities. This summit built on API efforts to support newsroom practices that help news organizations serve the range of diverse audiences in their communities. At a time of eroding trust in news organizations and increasing polarization in politics, part of the solution is for newsrooms to use listening and dialogue to form deeper connections, understanding and trust across communities. 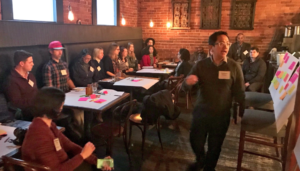 At our summit, we held in-depth discussions on how to create organizational cultures that embrace listening, effective strategies for facilitating dialogue among divided community groups, and other topics. Unlike a typical conference, the intimate, interactive summit allows each attendee to be an active participant, sharing their expertise and experiences while gaining actionable insights from others. See my report back for Free Press on the many components of the conference track. How might journalists and engagement practitioners learn from each other to build stronger local media ecosystems in North Carolina? This intensive day-and-a-half-long gathering brought together a mix of reporters, editors, producers, librarians, teachers, artists and activists to practice engagement and learn from one another while planting the seeds of collaboration. This event was hosted by the Agora Journalism Center, part of the University of Oregon’s School of Journalism and Communication, in local partnership with the News Voices: North Carolina team of Free Press. 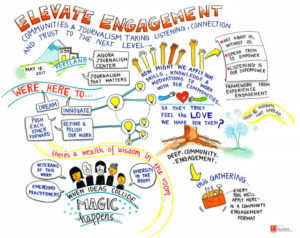 It following the success model of Experience Engagement and Elevate Engagement, two unconference gatherings held in Portland, Oregon in 2015 and 2017 respectively. Fellow team members: Andrew DeVigal, Erika Vogt, Cole Goins, Cassandra Profita, Alicia Bell. 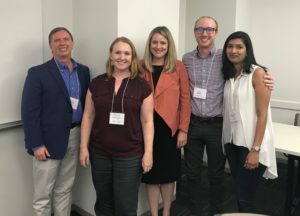 In cooperation with the Heinz Endowments and the Hillman Foundation, Media Impact Funders brought together a select group of local news leaders, funders and analysts to inform a research project on Pittsburgh’s news media landscape. There were no formal presentations, but participants were called upon to present their expertise and guide discussions at certain points in the program. The goal was to help Pittsburgh-based funders and outlets to connect local news trends with national ones, and to develop new approaches to meeting community information needs. On May 18-21, 2017, a diverse group of 130 journalists, researchers, engagement practitioners, and community leaders gathered at the Agora Journalism Center for the Elevate Engagement conference. Over a four-day journey, participants explored how engaged journalism can help communities thrive. More specifically, how could we take listening, connection, and trust to the next level? Team members: Anthony DeVigal, Peggy Holman, Regina Lawrence, Michelle Ferrier, Ashley Alvarado, Cole Goins, Kathryn Thier, Cassandra Profita. Innovative journalists, including Ariel Zirulnick of The New Tropic, Fiona Morgan of Free Press and Daniel Malloy of OZY will present what they’re working on in a lightning-round session, and then will host breakout conversations to discuss how other people can use or adapt their project. Moderated by DTH executive director Betsy O’Donovan. An informed democracy is the centerpiece of a working democracy. Panelists in this session will discuss the intersection of transparency in government, local activism, and nonprofit investigative journalism and how each strengthens the other. With: Jenn Topper (Sunlight Foundation), Michael Morisy (MuckRock), Jenny Zou (The Center for Public Integrity). The tools and tactics of organizing can be reworked for the newsroom context in ways that help supercharge community engagement efforts. Engagement is stronger when newsrooms move beyond digital platforms, meet with neglected parts of the community, listen to their concerns, identify shared interests and convene face-to-face meetings between residents and journalists. Journalists can apply great ideas from organizing to strengthen their reporting and rebuild trust. North Carolina Health News, a nonpartisan nonprofit news organization, hosted a one-day conference on how to preserve the legacy of Dorothea Dix Hospital. The event incorporated oral history, photography, policy and journalism. Portions of the event were broadcast live on UNC-TV, North Carolina’s statewide public television network. For the community dialogue, I worked with conference organizers to develop their goals for the discussion, then customized a process blending World Cafe and Appreciative Inquiry to use. I tapped into the network of local members of the National Conference on Dialogue and Deliberation to recruit a small team of co-facilitators. The discussion included former Dix Hospital residents, caregivers, patient families, mental health advocates and members of the interested public. Together we envisioned what a memorial to Dix should include, and how the process could honor the community’s history and legacy. See my blog post for Free Press reporting back on this conference. Mapping, Measuring, and Monitoring Local News Ecosystems, Media + the Public Interest Initiative, Rutgers University, December 2015, New Brunswick N.J. This working conference explored the question: What is possible when the public and journalists engage to support communities to thrive? Our intent is to illuminate, inform, and support community information health that contributes to thriving, inclusive communities by learning about processes that grow it, creating products that support it, catalyzing a community of practice dedicated to it, and identifying actions to amplify it.